Body Transformation: Lisa Torched Body Fat! Fitness became an afterthought when Lisa leapt headfirst into motherhood. See how she restarted her muscle motor and lost 21 percent body fat! I was a single parent for years and my son and I lived an active lifestyle. I loved to lift weights and hit the gym every day after work. In 2006, I got married and fell off track. In 2008, my husband and I had our first son together and it was difficult to leave our new baby for the gym and make time for myself. In July 2011, we had our second son which made it even more difficult to put myself first. By nature, we mothers tend to help others first and overlook our needs. By Christmas 2011 I reached my breaking point. I was unhappy how I looked and felt. I was broken inside and turned down invites to go out because I was embarrassed of my image. Then, just before New Years, I received an answer to my prayers from Bodybuilding.com inviting me to join the 2012 Dymatize $100K Transformation Challenge. I thought about it for a couple days and knew if I joined the challenge there would be no turning back. I felt nervous and doubted myself. Deciding to upload progress photos was a big deal. It was humiliating, but also a huge eye opener. I needed to see how terrible I looked. There was always a voice it the back of my mind that told me "you look great" and I never wanted to see the truth. 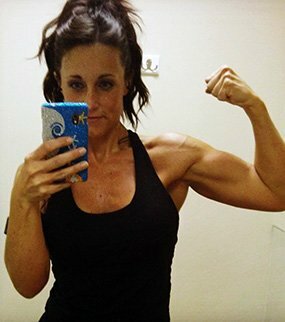 When I uploaded the before pictures to Bodybuilding.com I felt a sense of hope. Joining the challenge and uploading my before pictures for the world to see gave me accountability. I chose Jamie Eason's LiveFit Trainer and joined a gym at the hospital I worked at. I was dedicated to the lifestyle and hit the gym every day at lunch. The challenge came and went, and I completed the LiveFit Trainer, but didn't stop there. I loved the changes to my body and how happy I felt. Throughout my transformation, I completed many training programs and pushed outside of my comfort zone. I took bi-weekly progress photos with body measurements and checked my body fat monthly. I suffer from Hashimoto's disease, which is an autoimmune disease, but I never let it become an excuse. It slowed my metabolism, which only made me push harder. At that point, my transformation was featured at my gym and it felt like a great accomplishment. There were days when I felt down and discouraged, but I always brought myself back up with BodySpace. I connected with many wonderful people who were always there to encourage, motivate, and inspire me. They are the reason why I pay it forward and send out as much encouragement and motivation as possible. If I can do for others what my friends on BodySpace did for me then I will save someone the way I was saved. Throughout my transformation, I got to know my body and what worked best (low carbs and HIIT). I just completed Jim Stoppani's Shortcut to Shred and am happy with the results. This form of training and the nutrition plan helped me overcome a plateau that I was stuck on for months. I eat every 2-3 hours and drink at least a gallon of water per day. Training six days per week was a challenge and my gym lacked equipment, but I learned to be creative. I worked out every day during my lunch break which allowed me ample time with my family during the week. I want to walk on stage before I turn 40 years old. I'm not where I want to be yet, but I love every step of the journey. I was recently asked for help by colleagues and love training them on the side. It's motivating to guide their fitness journey. Follow a training and nutrition program. Cook your meals and pack them ahead of time. Take progress pictures every two weeks. Bodybuilding.com is where it all started. It provided the training and nutrition programs I needed and delivered reliable supplementation. I would've been lost without BodySpace. I received support, inspiration, and motivation from all of my BodySpace friends.